Animations can be used as both a learning tool and as a way for students to demonstrate mastery of content. In my anatomy and physiology classroom students are faced with learning a number of challenging physiology processes that involve multiple moving parts, steps, molecules, ions, and cells. With a traditional lecture style approach, these processes can be difficult for students to fully understand. Teacher whiteboards and student note sheets become a jumble of cell parts, proteins, ions, and other molecules with no discernible beginning or end making it difficult for students to learn. When students get home and begin reviewing their notes, they are often confused by what they wrote down in class. As a result, they simply put their notes away and wait for class the next day. The teaching method I describe in this post provides an opportunity for students to engage and re-engage with material in ways never possible before the introduction of the iPad and Animation Creator HD. Take a moment to explore the image below. 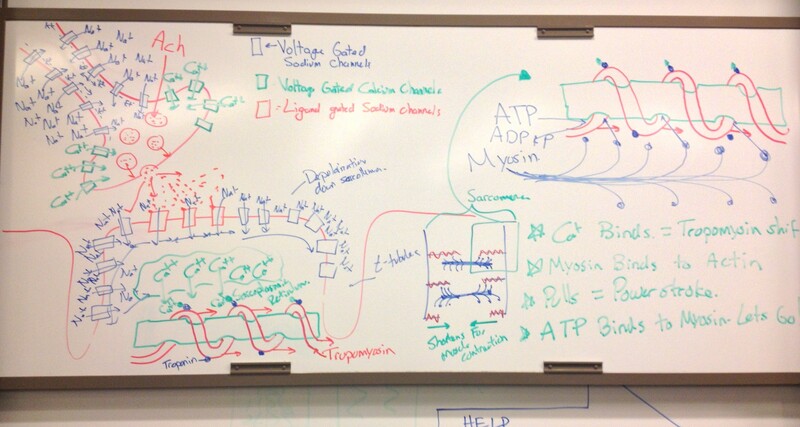 This is a picture of the whiteboard after a typical muscle contraction lecture. As you can see the board is a mess with ions, proteins, a number of arrows, plus signs, minus signs and a number of different labels. Even with color coding, it can be difficult to decipher the image. Imagine a student hearing this concept for the first time and then trying to make sense of their notes once they arrive home! When students create their own animations using the App Animation Creator HD, they understand the material more quickly and at a much higher level. How do I know this? Before I began using animation, students record their notes in a traditional paper and pencil manner based on my drawings from the whiteboard at the front of the room. Students struggle because these processes involve dozens of moving molecules, numerous cells, and many cyclical processes that have to reset themselves before occurring again and again. The introduction of animation changes the way students learn processes such as neuron action potential, muscle contraction, the immune response and the generation of ATP. By allowing students to create animated notes, they can see biological processes occur as a series of events. They are creating notes that allow science to unfold before their eyes on their iPad. These animated notes are much more powerful than any they can watch on YouTube for several reasons. First, the act of creating the animations jump starts the process of understanding because students get introduced to pertinent vocabulary as well as the structures and sequence of events. This familiarity with vocabulary is based on my requirement that my students overlay an audio explanation to their animations for homework. This final step might be one of the most powerful parts of this project. Requiring my students to add audio to their project forces them to re-engage with the material at home. During the process of recording audio, many students will spend a great amount of time rerecording sections in attempt to get it “perfect.” This added auditory practice, combined with the repeated viewing of their animations has led to a much quicker and deeper understanding of the material. The final part of this project involves viewing the animations the next day as a whole class. I have noticed that students that are typically reluctant to share in class find this project a comfortable medium to highlight their understanding of the content. Students, in general, were eager to share their animations with me and the class. Reviewing the animations together as a class provided a collaborative and safe forum for peer editing. Students helped each other by pointing out inaccuracies that were sometimes being made in their animations. For example, during our study of the biochemistry behind muscle contraction, students were able to point out places in their peer’s animations where they had switched ions, used the wrong neurotransmitters, or incorrectly named the protein channels. Before using this learning process, I would expect this level of understanding at the end of the unit, not on the second day. These are also available on YouTube and are a great resource for students to watch before they come to class.